I have been a fan of Atkins and Potts for a while, their syrups and glazes are an essential baking and cooking ingredient in my kitchen. When they asked if I would like to try some of their gluten free range, I jumped at the chance! The choice of interesting and exciting GF sauces out there is somewhat limited; usually you'll find a korma and probably something tomato based in the freefrom aisle... and that's about it. Not any more. White Wine Sauce with Smoked Garlic and Thyme is a perfect accompaniment to chicken. The smoked garlic is brilliantly smoky (natch) and mellow, it adds a wonderful twist to the traditional white wine and thyme sauce. This is a finishing sauce, so after cooking your chicken or pork, you use it to deglaze the pan and pick up all those tasty bits of meat and the juices into the sauce. It's the kind of sauce that taste like it took ages to prepare, but really it's as easy as snipping the corner off the pouch! The Chasseur Cooking Sauce is delicious and deeply flavoured. Ok, it is a tomato based sauce, but this one is so much more than your run-of-the-mill tomato and basil, this is complex and rich enough to stand up to the game casserole we had it with. Is it just me, or do all restaurants seem to put flour in their peppercorn sauce? I have never made it with any thickener so I'm always disappointed when waiting staff tell me I have to eat my steak plain, again. 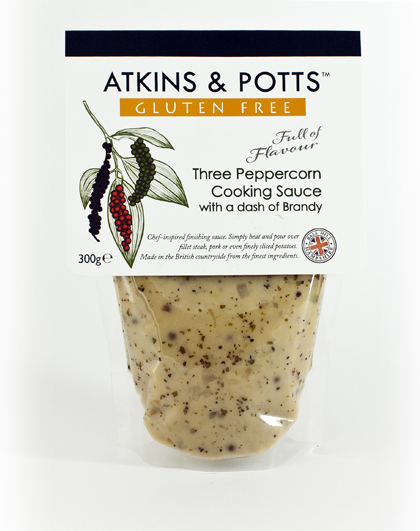 Thankfully, Atkins & Potts have a gluten free Three Peppercorn Cooking Sauce that's restaurant quality that's quick and simple for cooking at home. I can't help you with the steak, although cooking it Heston's way has always worked for me. 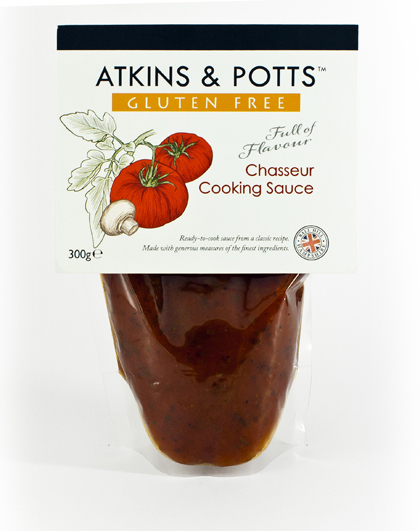 You can buy the sauces at stockists across the country or you can shop online at atkinsandpotts.co.uk. Don't forget to check out the rest of their ranges, many of their products are made without gluten. I am actually salivating reading this. I'm not even gluten-intolerant but I totally want to get with these sauces. yeah.